Soulbury Middle Lock No 25 is a minor waterways place minor waterways place place on the waterways major waterways place village town city on the Grand Union Canal (Grand Junction Canal - Main Line - Gayton to Brentford) between Willowbridge Bridge No 99 (2 miles and 3¾ furlongs and 2 locks to the north) and Marsworth Junction (Junction of Grand Union Aylesbury Arm with Main Line) (12 miles and ½ furlongs and 13 locks to the south). It is part of Soulbury Three Locks. The nearest place in the direction of Willowbridge Bridge No 99 is The Three Locks PH (Formerly The Grand Union PH); ¼ furlongs away. 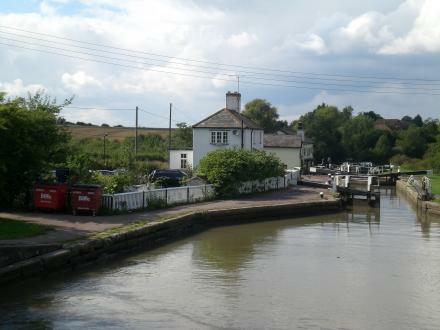 The nearest place in the direction of Marsworth Junction is Soulbury Top Lock No 26; ½ furlongs away. Soulbury — 723 yards to the south. Leighton Road, Milton Keynes, MK17 9 — 1385 yards to the northwest. Leighton Buzzard — 68 yards to the west. Ridge farm Dean farm Lane Soulbury, Leighton Buzzard, LU7 0DE — 1102 yards to the southwest. Milton Keynes, MK17 9AF — 1626 yards to the east. Ivy Lane, Great Brickhill, MK17 9AH — 1626 yards to the northeast. 3 Mount Pleasant, Milton Keynes, MK17 9EX — 1270 yards to the northwest. The Three Locks Golf Club, Great Brickhill, Milton Keynes, Buckinghamshire, Milton Keynes, MK17 9BH — 671 yards to the northeast. Great Brickhill, Milton Keynes, MK17 9BH — 448 yards to the north. Soulbury — 1625 yards to the southwest. 42 Manor Close, Stoke Hammond, Milton Keynes, MK17 9DJ — 1426 yards to the northwest. Soulbury, Leighton Buzzard, LU70DE — 1310 yards to the southwest. Stoke Hammond — 1623 yards to the northwest. Stoke Hammond, Milton Keynes, MK179DB — 1318 yards to the northwest. Soulbury, Leighton Buzzard, LU7 — 1625 yards to the southwest. MD Autocare, Workshop Olde Bell Close, Stoke Hammond, Milton Keynes, MK17 9BZ — 1516 yards to the northwest. Ivy Lane, Milton Keynes, MK17 9AH — 1588 yards to the northeast. Partridge Hill, Great Brickhill, MK17 9BH — 224 yards to the east. Leighton Road, Stoke Hammond, MK17 9BB — 990 yards to the west. Village Hall, Great Brickhill, MK17 9AS — 1626 yards to the east. Milton Keynes — 1347 yards to the northwest. Leighton Buzzard — 1469 yards to the southwest. Leighton Buzzard — 1370 yards to the east. Great Brickhill Rd, Milton Keynes, LU 7 0 — 94 yards to the southeast. Bragenham Side, Stoke Hammond, MK17 9DB — 1324 yards to the northwest. Bragenham Side, Stoke Hammond, MK17 9DB — 1315 yards to the northwest. Grand Union Canal, Milton Keynes — 1124 yards to the north. 1219 yards to the southeast.